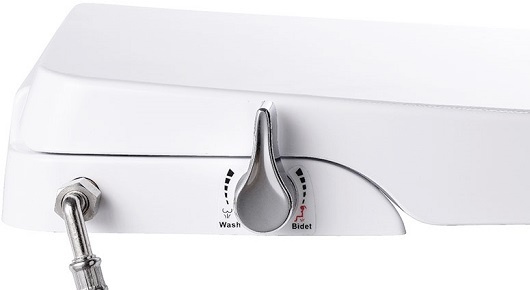 Bio Bidet A5 Stream has been discontinued and no longer in stock. 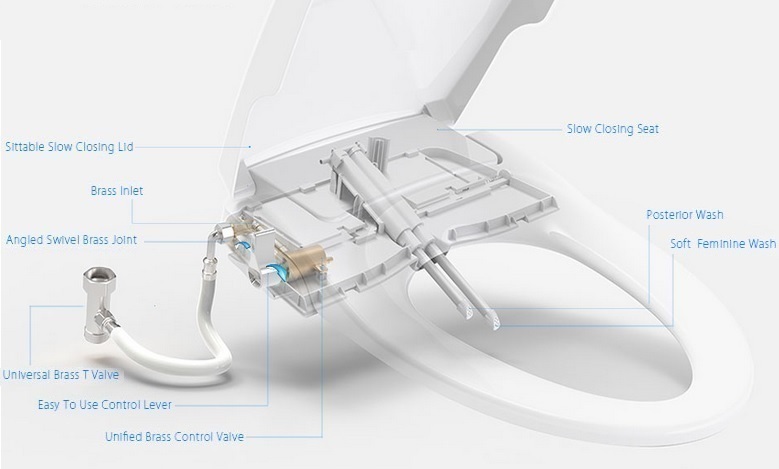 The Bio Bidet A5 Stream is a non-electric bidet seat that takes the place of your existing toilet seat. The A5 is a slim and streamlined unit that is much thinner than other bulkier attachments. A dual nozzle design uses one nozzle for the posterior wash and a separate nozzle for the feminine wash. The BB A5 is operated with a simple control lever attached to the right side of the unit as you are using the seat. Pushing the lever forward initiates the feminine wash, and pulling it back from center activates the posterior wash. The water pressure is adjustable and is easily regulated based on how far forward or backward you move the control lever during the wash. The Bio Bidet A5 Stream is a great solution for those who want a bidet seat, but have issues accessing a nearby electrical outlet. The bidet is powered by water pressure alone, so electricity or batteries are not required. Installation is easy and takes about 20 minutes. Just remove your existing toilet seat and secure the A5 mounting bracket with the bolts provided. Once the mounting bracket is in place, the bidet slides on and "clicks" into place. The water hose connects to the existing cold water supply behind your toilet so there is NO additional plumbing required. Available in elongated size only. All water lines and fittings come included for complete assembly and installation. One of the best purchases I have made! I was really concerned that the water would be extremely cold, but I was pleasantly pleased, not cold at all. If anything should happen to this bidet, I will definitely purchase another one. Wish we had purchased this bidet years ago.